Amy was born in Ashford and emigrated to Canada. John Sled, her son, has pulled together her memories and emailed it over to the village. It’s well worth a read and a fascinating insight into late Victorian Ashford Carbonell. John is looking for more information from that time, maps, people, places. If you know anything email the Editor and we’ll pass the information on. By 1907 Ashford Court had, for nearly 50 years, been let to a variety of tenants, and was probably in urgent need of renovation and modernisation. It was purchased in that year by someone who actually intending living there himself, Major Claud Herbert Campbell, late of the 8th Hussars. Work started immediately and two identical cottages were built for staff. One was Rose Cottage, now known as Rosemead, recently put on the market. It was intended for occupation by the Gardener and was used for that purpose until the estate was broken up in 1950. It has remained almost unchanged since 1907, the only concession to modernity being the conversion of one of the three bedrooms into a bathroom. The other cottage, situated next door to The Lodge, and designated The Cottage (still its name), was for the Coachman/Chauffeur. Over the years it has been much enlarged and modernised and bears little resemblance to its one-time twin. Major Campbell also needed telephone and electric light. A telephone line had to be brought in all the way from the main Ludlow-Hereford road, over the railway and river bridges and down the village street, presumably connecting with the Post Office at No.5. He also negotiated with Williams Downes Hall, the owner of Ashford Mill, a lease “for 99 years of right to place a turbine in Ashford Mill and to carry poles and cables across lands of the lessor for an electric light supply to Ashford Court”. This was subsequently replaced by a petrol-driven generator, which remained the only source of power until mains electricity was brought into the village in the late 1950’s. In the run-up to the Centenary of the start of WW1, I thought you might be interested in the attached information. My interest is that I was born in The Bakery in Ashford Carbonel, where my grandfather and father were the bakers up till 1949, and also that amongst father’s photos is one of him and his father, together with the young men who were proposing to sign up in 1914. I don’t know the exact date it was taken, but my father told me it was taken in the churchyard one Sunday after Morning Service, probably in October or November, 1914, though it would appear from the hedge in the background that it was taken when all the leaves had fallen. My father, Gilbert Shingler, then aged 5, is standing in the middle in front of his father, Alfred Shingler, Churchwarden, then aged 45. I have no idea who the rest of the young men were, or the man and boy on the left. 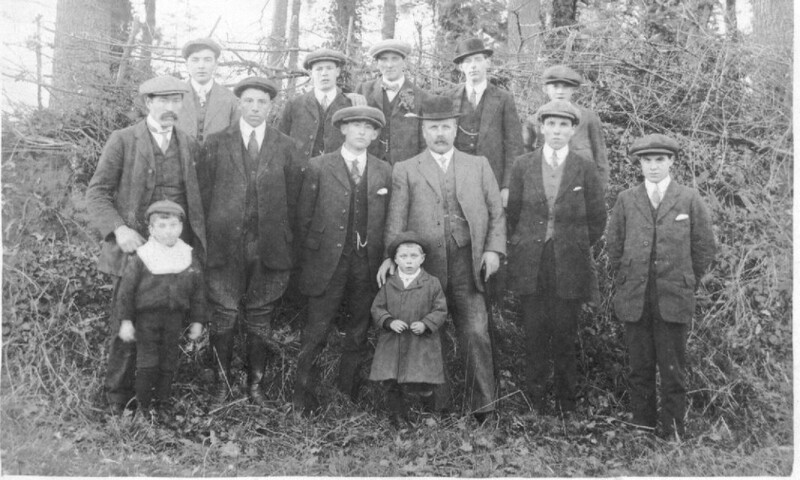 It might be worth going through the 1911 census of the village to see lads of an appropriate age, or it might be that some of the family members still in the village may be able to identify; or there could well be other copies of this photo or similar still around, as it was obviously a set-up shot. I am also attaching a summary of some of my research into the names on the War Memorials. I am sorry that I have not been able to positively identify the “A Carter”, and being a common name there are lots of A Carters in the casualty lists, and nothing to link any of them specifically to Ashford Carbonel. There were no Carters living in Ashford Carbonel or Ashford Bowdler in the 1911 census but I have been able to identify all the others. The Davies brothers were a bit tricky, but once I had identified the one they both fell into place. John and William were the eldest out of five boys of a John Davies and his wife Sarah Jane. John was a carpenter and joiner and in 1891 the family were living in Condover, in 1901 they were living in Bitterley, and in 1911 they were living at No 6, Ashford Carbonell, but by the time of the certificates to John and William they had moved back to Ryton near Condover. I am also attaching the certificates for the eight men that I have been able to identify (Editor note: you can access the certificates by clicking on the Burial/Memorial place name). I hope they all manage to come through OK. No doubt there could be a lot more information to discover by going to their respective regiments. W. F. Davies William Edward Davies KSLI 7th Bn.Sergeant 13016 14 July 1916Age 28 Thiepval Memorial Son of John and Sarah Jane Davies of 2, Yewtree Cottages, Ryton, Dorrington, Shrewsbury: husband of Elizabeth Jane Davies of 3, Yewtree Cottages, Ryton, Dorrington, Shrewsbury. R.J. Sankey Richard John Sankey Royal Field Artillery, Driver. “C” Bty. 256th Bgde.155211 12 November 1917Age 33 St Sever Cemetery extension, Rouen P.III.L.11.A Husband of Eleanor Gertrude Sankey of Church House, Ashford Carbonell, Ludlow, Salop. Harry Bruges Fisher Harry Bruges Fisher Lieutenant Colonel WiltshireRegiment commanding 12thBn. Yorks and LancashireRegiment. 3 October 1916Age 38 Le Touret Military Cemetery, Richbourg-L’avoueIV.B.31 Son of the late Col. Fisher and Mrs. Fisher, of Ty Mynydd, Radyr, Cardiff; husband of Annabella Sybil Fisher (nee Dansey), of Manor House, Richards Castle, Ludlow.